In the report the HS2 Residents’ Commissioner sets out her activity since taking up the role in January 2015, some initial recommendations and a brief run through of her next steps. 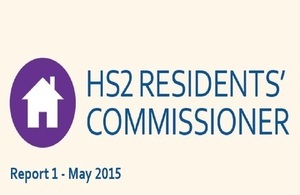 HS2 Ltd chairman, David Higgins, will be publishing his response to the report in due course. It is vital that those who are eligible for the Government’s property compensation and assistance schemes get clear information and know what they are entitled to. My role is to ensure that this happens. The Commissioner is continuing to monitor the implementation of the property schemes and will soon begin meetings with MPs whose constituencies the new railway will run through to learn more about the impact on communities. The next progress report from the Commissioner will be published later in the summer. HS2 will be a Y-shaped high speed rail network connecting London with Birmingham; Manchester and Leeds. HS2 trains will then join the existing network for direct onward services to northern England and Scotland. Switching long distance inter-city services to HS2 will make room on the existing railway to run more local, regional and freight trains providing more seats for passengers and taking freight off the roads. The hybrid Bill for Phase One of HS2 between London and the West Midlands, effectively the planning application, was deposited into Parliament on 25 November 2013. At its second reading (28 April 2014) MPs voted 452 to 41 in its favour. HS2 Ltd is a company wholly owned by the Department for Transport (DfT).